One of the Hispanic Society's finest works by Sorolla, this portrait of Louis Comfort Tiffany is a masterpiece. Its broad expanse of colorful yellow, white, and blue flowers, the deep blue of the waters of Long Island Sound flashing in the background, and the complex whites of Tiffany's summer suit create a work of irresistible attraction. Tiffany's steady gaze engages the viewer as he pauses at his easel, palette and brushes in one hand, the brush with which he works in the other. 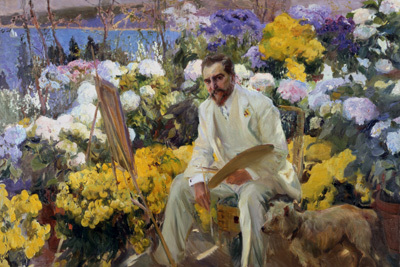 The setting, the garden of Tiffany's home on the north shore of Long Island, also fulfilled Sorolla's preference to paint "even portraits" outdoors. In picturing Tiffany amid the profusion of garden flowers, Sorolla created a range of shadings in Tiffany's white suit and the even lighter white of his shirt and his cuffs as these whites vividly reflect and hold the diverse colors of Tiffany's surroundings. Tiffany had chosen his portraitist well; the men had probably met at Sorolla's Hispanic Society exhibition early in 1909, when Tiffany bought no fewer than four paintings. But not until Sorolla returned to New York could the portrait session with Tiffany be scheduled in May 1911. For many years, this portrait of Tiffany remained in the central Moorish-style patio at Laurelton Hall installed mere steps away from where it was painted. The canvas subsequently entered the Hispanic Society as a gift from Tiffany's family.